I did a shake down overnight trip to Poulsbo to test some of the new improvements and changes to the boat. 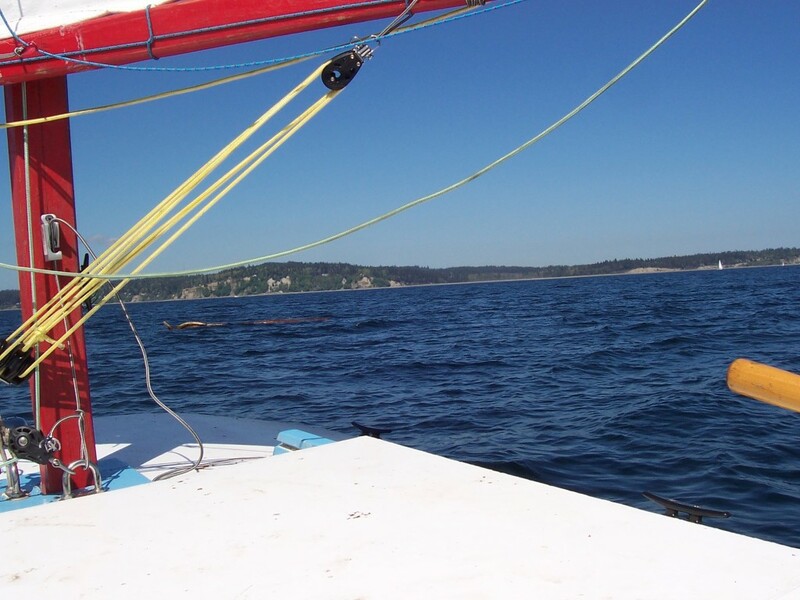 The winds were from the south, witch made for a fast 3.5 hour passage with a fast yet leisurely reach across the sound. It was an event for the cruising set at the CYC so there was a great potluck and an entertaining game of cards against humanity. I even scored a smallish, lighted Richie compass for the boat for $6 from Longship Marine. I spotted a tree just off the shipping lanes. The picture doesn’t do it justice. it was about 6 inches in diameter at least, with a gnarly stump on the end that stuck above the water. it was a great weekend out ,with the exception of some confused seas i na few places on the way back on Sunday. i rarely get out in this area when winds are from the south so it was a fresh experience, as the winds and waves made traversing some areas much different, especially around the north end of Bainbridge island and thru the channels back to Poulsbo. As to the boat’s progress, last week the hatches, the andersen bailer, the oarlocks, the preventer to keep the mast stepped, and the mainsheet cleats went in and I made a tiller extension. Overall, the changes were a success, except the andersen bailer. It just won’t bail. I think it’s a combination of the hull shape and the lower speed. As it is now, it’s just a pretty cockpit drain. I may eventually swap out to a venturi super sucker type, but for now this will do. the mainsheet cleats were handy to have. these are on the wall of the cockpit well, to give me some way to free up a hand for a few minutes. They worked beautifully on the reach over to port madison. the oarlocks were ones I fabricated out of stainless, and I’m happy to say that they appear to be the ticket. I did find a few things I will still need to change. I thin k i’ve got a better storage idea for the oars to keep them out of the cockpit, and the mainsheet tackle will probably see a revision. When I got back to the boat ramp, I tested the pump-out system. I filled the boat with water, and pulled the tape holding the float switch down. My estimates of 10 minutes to empty the cabin were fairly accurate, however that is a long time when you have to sit there and watch it. While it definitly increases the chance of self rescue, it isn’t going to be a fun experiance if I ever need to do this in rough seas. i may add some floatation to the bow; I’ll be thinking about this one for a while. 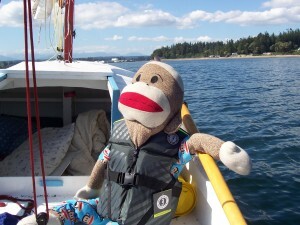 And to explain the monkey- last week my son said it’d have to be ‘triple safe’ for him to take another trip n the boat. 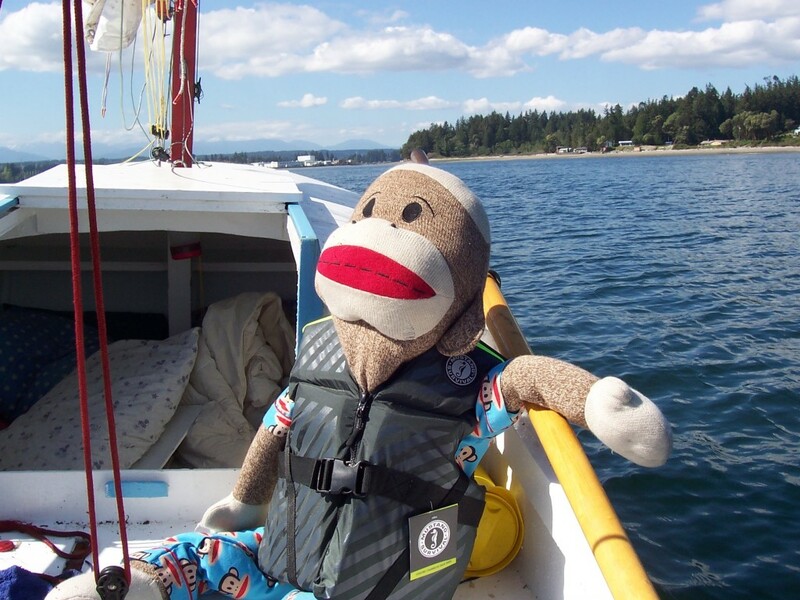 Last time he was out in it was last July when the boat went turtle off of Bainbridge island, so this is Understandable. I took him out back and showed him the changes and the pump system, and he judged it ‘two and a half times safe’.